A well-timed lunge for the line earned Tori Bowie the women’s world 100m gold by the tiniest of margins ahead of Marie-Josée Ta Lou in a race that saw Olympic champion Elaine Thompson beaten into fifth. The US victory for Bowie and Jamaican disappointment for Thompson mirrored the men’s 100m result from 24 hours earlier when Justin Gatlin shocked Usain Bolt. It means the United States own both world 100m titles for the first time since 2005. Ta Lou, of the Ivory Coast, enjoyed the race of her life and looked like she was blasting to glory. 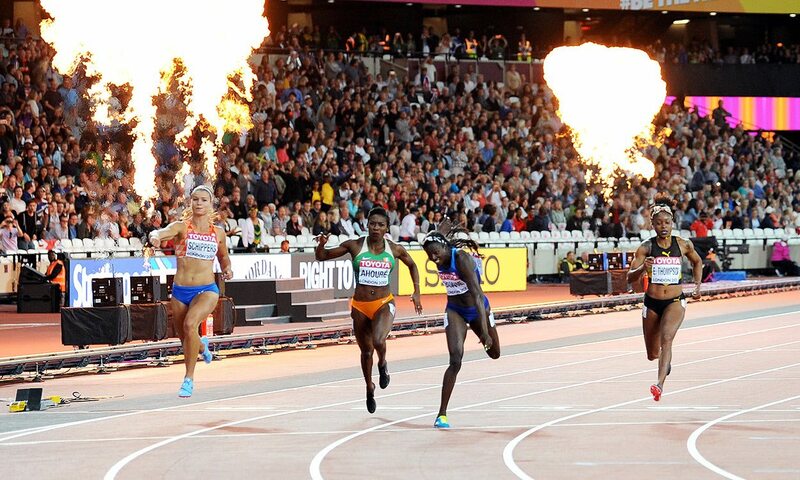 Even as she crossed the line – in a PB of 10.86 – it looked as if the 28-year-old had taken the title. But finishing determinedly and with a perfectly-judged dip at the line, Bowie edged past Ta Lou by one hundredth of a second to win gold in 10.85. In third, Dafne Schippers of Netherlands clocked 10.96 as Murielle Ahoure, also from the Ivory Coast, was fourth in 10.98 and Thompson fifth in 10.98 after the Jamaican never really got to grips with the race following a slow reaction to the starter’s pistol. As Bowie fell on to the track as she dipped, it was reminiscent of Shaunae Miller-Uibo throwing herself at the finish to win the Olympic 400m title last year ahead of Allyson Felix. Bowie, a psychology graduate from the University of Southern Mississippi, won 100m bronze at the World Championships two years ago and, in Rio last year, Olympic gold, silver and bronze in the 4x100m, 100m and 200m respectively. But she has enjoyed a great season in 2017, winning the US 100m title and, at the Diamond League in Eugene, beating a stacked field of Thompson, Schippers, Miller-Uibo and Felix over 200m. With the 200m yet to come in London, Bowie has the chance to win a golden double, as long as her fall at the finish line has not caused her any damage. “I’m a bit sore but I’m pretty sure it’s just bruises and I’ll be fine tomorrow,” she said. Britain have never had a finalist in the women’s 100m at the IAAF World Championships and the curse continued in London. The class of 2017 reached the semi-finals but Daryll Neita was fourth in the first heat in 11.16, Asha Philip was seventh in heat three in 11.19 and Desiree Henry fifth in heat two in 11.24. The Brits were not alone in exiting at that stage. Nigeria’s Blessing Okagbare, the Commonwealth 100m and 200m gold medallist, went out in her semi-final, as did Germany’s Gina Lückenkemper, who had smashed the 11-second barrier in the heats.